We had this for breakfast on Sunday it was seasonal, tasty and a pretty healthy way to get set up for a hefty morning of gardening (we’re doing a little amateur landscaping in the back garden). It’s nearing the end of the asparagus season now so I’m trying to include it in meals whilst its still around. I really love it with eggs, they are perfect partners. Place the asparagus in boiling salted water for between 3 – 5 minutes. Whilst the asparagus is cooking toast the bread and fry the eggs. When the asparagus is done drain the water and pop in a small knob of butter. Season the asparagus with salt and pepper. Butter the bread. 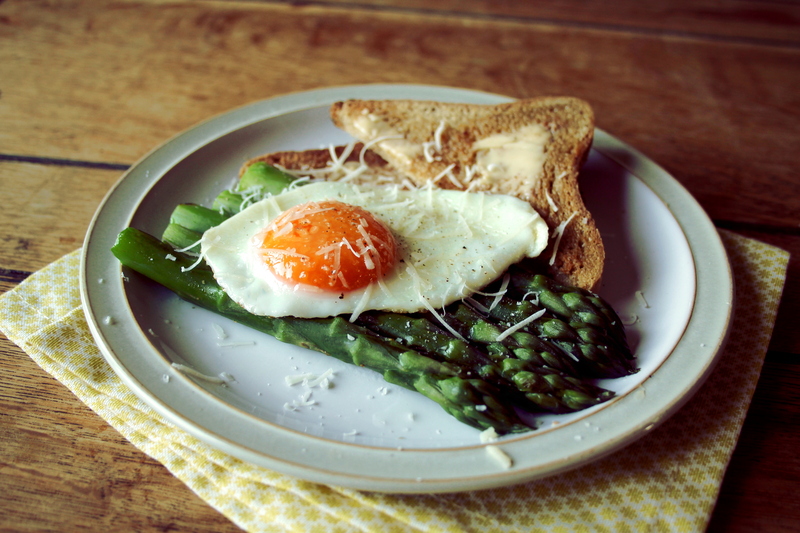 Place the warm asparagus on two plates and top with the fried eggs. Season the egg with salt pepper and a little grating of parmesan. Enjoy.